MOST RECENT DIARY ENTRIES ARE AT THE TOP SO PLEASE READ DOWN - MOST RECENT PHOTOS ARE ON THIS PAGE BESSIE WAS PUT TO SLEEP AT HOME IN THE GARDEN ON A BEAUTIFUL SUNNY AFTERNOON WITH US ALL AROUND HER. UPDATE - 27th May - Time to say goodbye:( How quickly things can change, though I had been prepared for this day it doesn't make it easier when it's time to make the decision to end a life. Dear, sweet Bessie - no more aches and pains, running free with her friends. Special thanks to David Holmes, my lovely vet from Golden Valley Vets and all the staff for their patience and kindness. UPDATE - May 22nd - No significant problems but obvious signs of slowing down more when on walks. It's almost as though her feet are sore or like walking on pebbles. Unexpectedly her weight has gone down more to 15.2kg - a full 2.5 kg less than in January. I'm going to increase the size of her portions of food in an effort to halt this decline and hope that it doesn't produce more bouts of diarrhea. Today we had a really enjoyable walk at Charterhouse, nice old turf that is kind on her feet! Even Dusty seems to be perking up just a little and went about her own business rather than lagging behind and just plodding along. I love to see them walking together, 2 old ladies side by side! UPDATE - May 12th 2011 - A happy few weeks with a trip to Snowdonia in the campervan last weekend that went smoothly. Lots of pics taken that will be always treasured. Only one bout of diarrhea which was yesterday otherwise on very good form, eating well and walking with enthusiasm, still eager to go out every time I go towards the door. Disappointingly she hasn't gained any weight and is still a bit boney at 16kg. UPDATE - April 20th 2011 - A month has passed now and we are still passing the 50% rule, mostly life is good for an old lady as long as I don't forget that she is very old and therefore more fragile than SHE and I think. We had a really nasty bout of diarrhea requiring medication, and she is currently having 7.5mg of Mirtazapine daily to stimulate her appetite which is working well. Generally there is a slow but steady decline, mostly noticeable in the speed and distance she is comfortable walking. Still eager to go out every time I go to the car though! 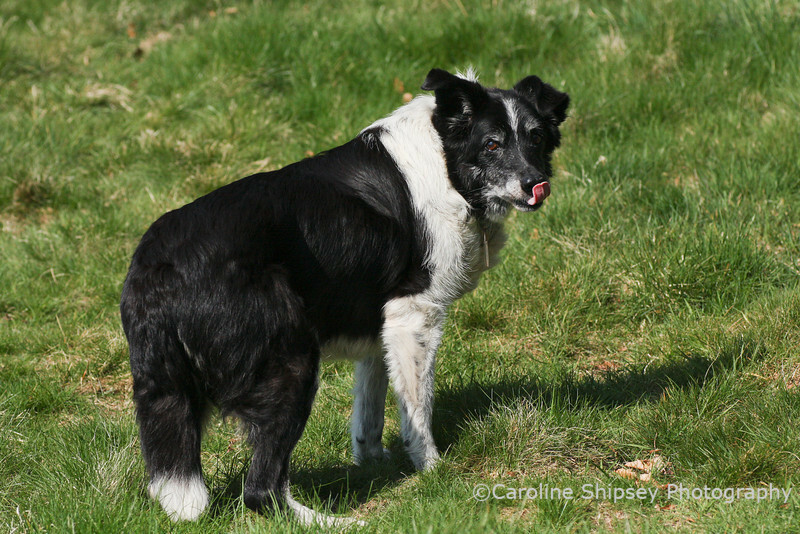 March 18th 2011 - This is a very personal project following the end of life of my dog Bessie. Just a bit of background info - she's 16 years old and has Chronic Renal Failure - diagnosed June 2010. Apart from Zantac (liquid ranatidine 2.5ml x2) which prevents her from getting ulcers, and Incurin for incontinence, I've dealt with her problem by managing her diet. She's done pretty well with just a few hiccups along the way but about a month ago she started to eat less and sometimes not at all. I went into panic mode at this stage trying to find the reason why, and how to get her eating normally again. From her blood tests etc it seems there is nothing bad happening that can be treated, she is now a very old lady! This is where the problem lies for me - not her - I wanted to pump food into her, that's a major indicator of her health isn't it? If a dog doesn't eat it must surely be sick? Even if there are no outward signs? Well actually no, it's fine for an old dog to eat less or even nothing at all, and continue to live a happy, comfortable and reasonably active life. It's even fine for a dog to live and ultimately die without veterinary intervention, ie euthanasia, as long as they aren't suffering any pain. When you've shared your life with an animal for 16 years it's inevitable that you will be acutely aware of every tiny nuance of their feelings. It's important not to look too hard for bad things or to create them in your own mind when they simply don't exist though. I don't know how the last day of Bessie's life will be but I thought by documenting and sharing it maybe others would be comforted, and even encouraged to enjoy every day more instead of focusing on, and dreading 'the end'. Taking photographs is a very therapeutic way for me to deal with what is happening, it helps me to see more of the positive and is a tribute to her. I've hundreds of photos of her and my other dogs taken over the years, and although this journal will focus on current images there will be others too. Bessie's Diet - she no longer will eat 'normal' dog food and her preferences change almost daily. My butcher is getting used to me asking for small amounts of cooked meats and the more unusual things on offer. Ox tongue has been OK for several days now, venison when I can get it, and now chicken livers are acceptable. Fish and chicken are not liked, nor anything fatty. Mostly I feed her by hand now. She doesn't eat at 'normal' feeding times anymore, generally will first show signs of interest around lunch time, and then eat more at around 7-8pm. This was taken at the end of the walk, she sinks down while standing for a short while. Also has difficulty getting up from sitting and lying down. Hopefully some rest will help.